Normal operating configuration of the system. Failure of any single computer does not affect normal law. Covers 3-axis control, flight envelope protection, and load alleviation. Has 3 modes according to phase of flight. Active when aircraft is on the ground. Direct proportional relationship between the sidestick deflection and deflection of the flight controls. Is active until shortly after liftoff. After touchdown, ground mode is reactivated and resets the stabilizer trim to zero. Becomes active shortly after takeoff and remains active until shortly before touchdown. Sidestick deflection and load factor imposed on the aircraft are directly proportional, regardless of airspeed. With sidestick neutral and wings level, system maintains a 1 g load in pitch. No requirement to change pitch trim for changes in airspeed, configuration, or bank up to 33 degrees. At full aft/fwd sidestick deflection system maintains maximum load factor for flap position. Sidestick roll input commands a roll rate request. Roll rate is independent of airspeed. A given sidestick deflection always results in the same roll rate response. Turn coordination and yaw damping are computed by the ELACs and transmitted to the FACs. No rudder pedal feedback for the yaw damping and turn coordination functions. Transition to flare mode occurs at 50' RA during landing. In the event of a go-around, transition to flight mode occurs again at 50' RA. Prevents pilot from overstressing the aircraft even if full sidestick deflections are applied. Pitch limited to 30 deg up, 15 deg down, and 67 deg of bank. These limits are indicated by green = signs on the PFD. Bank angles in excess of 33 deg require constant sidestick input. If input is released the aircraft returns to and maintains 33 deg of bank. 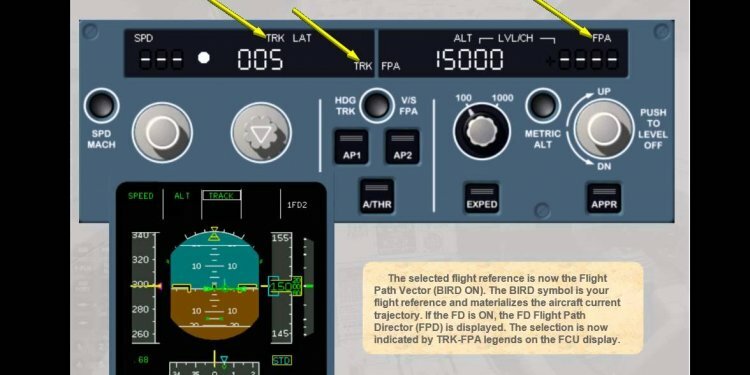 When alpha exceeds alpha prot, elevator control switches to alpha protection mode in which angle of attack is proportional to sidestick deflection. Prevents exceeding VMO or MMO by introducing a pitch up load factor demand. The pilot can NOT override the pitch up command. Available in CONF 2, 3, or FULL between 100' and 2, 000' RA when TOGA not selected. Produces aural "SPEED SPEED SPEED" when change in flight path alone is insufficient to regain a positive flight path (Thrust must be increased). If Multiple Failures of Redundant Systems occur, the flight controls revert to Alternate Law.